Making your own laundry detergent is a great way to save money and is a natural way to get your clothes clean without adding questionable chemicals to your water system. 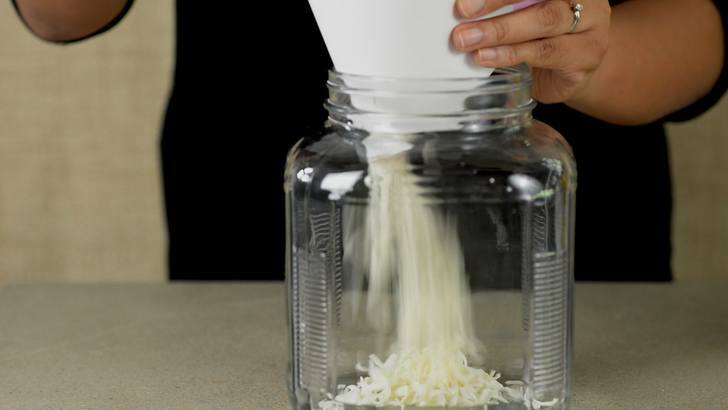 This recipe will work in HE washers and will dissolve even in hard water or cold water. 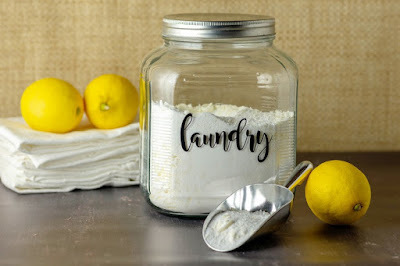 The recipe uses just three simple ingredients and can be doubled or even tripled to suit your laundry needs. All of these ingredients can be found at your local grocery store in the laundry aisle. 1 bar Dr. Bronner’s Castile Soap – We used Citrus, but you could also use Peppermint or Lavender. Some people get nervous at the mention of Borax. No need to fear it! Borax is a naturally occurring mineral made up of sodium, boron, oxygen, and water. It is an effective natural cleaner and a safer alternative to many types of conventional cleaners. Aside from this laundry detergent recipe, there are many ways to use Borax. Washing Soda is made from common salt and limestone or found as natural deposits. It’s a natural laundry booster and helps lift stubborn stains from clothes. As for the soap addition to the detergent, I prefer to use Dr. Bronner’s Castile Soap. Dr. Bronner’s soaps are fair trade and made with vegetable castile soap and pure organic oils. The hemp citrus bar is perfect for adding a pleasant scent to the detergent, while peppermint, lavender or even unscented versions would be fine. One of the first things you will notice when using homemade detergent is the lack of suds. Do not worry -your clothes are still being cleaned. The amount of suds that are made by a laundry detergent have nothing to do with the cleaning power of that product. Detergents clean without producing a vast amount of suds. If you prefer, scroll down to see our step-by-step written instructions with photos. 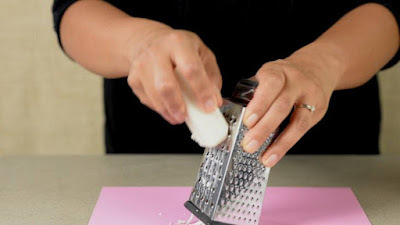 With the cheese grater, shred one bar of castile soap. Dump the soap shaving into a large container. 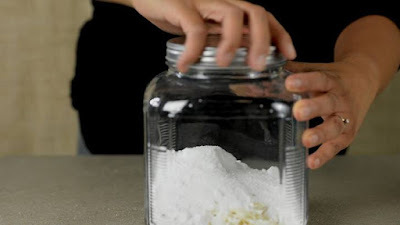 Add in two cups of washing soda and two cups of borax. 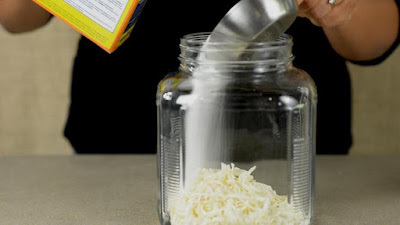 Place a lid on the jar and shake until combined. You can use up to 1/4 cup of detergent per small load of laundry.